DriveWorks allows sheet metal functionality to be controlled based on your rules. Some sheet metal features are fully constrained by SOLIDWORKS and do not allow certain parameters to be captured. This article discusses sheet metal functionality in depth and suggests alternative methods for controlling the features that would otherwise be fully constrained by SOLIDWORKS. The use of a gauge table in the sheet metal part allows the required gauge to be selected from a drop down list in the SOLIDWORKS feature manager. As DriveWorks automatically generates models this is something that needs to be overcome. Locate the gauge table currently in use. This is usually stored in C:\Program Files\SOLIDWORKS\SOLIDWORKS\lang\ country\Sheet Metal Gauge Tables. When using a custom table it can be located by editing the sheet metal feature and clicking the Browse button under Sheet Metal Gauges. Open the table in Excel and reformat the data so it can be used with the VLookup or ListAll functions and includes only the information needed. Note in the image below the Available Bend Radius data has been modified so the original ; separating each available bend radius now uses the | symbol so it can be used in a list control on the user form. This column could be omitted altogether if rules can dictate the bend radius required. Open the Project Designer and select Define Tables from the task explorer. Create a new table and copy the data from the gauge table into the table in the project designer. Open the captured sheet metal part in SOLIDWORKS. Enter a name for the gauge in the Dimensions and Features window of the DriveWorks tab. Bend allowance or bend deduction tables will update the model when the material gauge or bend radius is changed by DriveWorks. To actually change the bend table, for instance when the material is being driven, create the bend table in DriveWorks and drive the Type and Bend Allowance or Bend Deduction advanced feature parameter values. Locate the bend table currently in use. This is usually stored in C:\Program Files\SOLIDWORKS\SOLIDWORKS\lang\ country\Sheetmetal Bend Tables. When using a custom table it can be located by editing the sheet metal feature and clicking the Browse button under Bend Allowance. Follow steps 1 and 2 for any other bend tables that are required to be utilized. Under Bend Allowance select "Bend Allowance" from the drop down, click OK to close the feature properties tab. Select the Sheet-Metal feature from the feature manager. In the DriveWorks Dimensions and features tab enter a name for the sheet metal feature and click Add to capture the feature. The advanced feature parameters window can be expanded to show all available advanced feature parameters for the captured feature. Select the advanced feature parameters required to be controlled. Click Update to update the captured feature with the selected advanced feature parameters. Click Save on the DriveWorks toolbar. When more than one bend table is required create variables that determine the bend allowance to extract from each, making use of the VLookup or . DWVLookup functions. 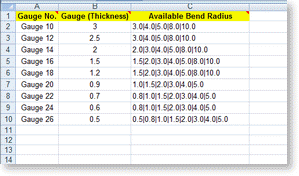 Depending on how the bend table is formatted in DriveWorks, other variables may be required that determine the Radius, Gauge and column number to use in the Lookup function. A user form has the option of selecting Steel or Brass for the material and also a range of gauges for each material. The variable DWVariableBendRadius, calculates the bend radius. Create a variable DWVariableThicknessColumnNumber to determine the column number to use in the above tables. This could be a series of nested If functions or create another table that lists the available Thicknesses in one column, with the corresponding column number in another column, and then make use of the VLookup function. Create a variable that extracts the Bend Allowance from the Steel Bend Table (DWVariableSteelBendAllowance) and a variable that extracts the Bend Allowance from the Brass Bend Table (DWVariableBrassBendAllowance). From the Project Designer select Model Rules from the task explorer. Select the model the feature has been captured from in the model list. All captured parameters for that model will be displayed in the main window, locate the sheetmetal\Bend Allowance feature parameter, select and click Build. 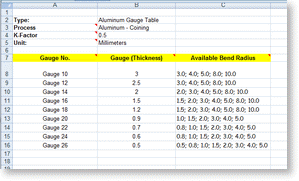 The bend allowance type is displayed as sheetmetal\Type in the Model Rules section. When sheet metal parts are unfolded using the K Factor to calculate the developed length, this can be captured and driven using the advanced feature parameters. Select K Factor from the advanced feature parameters. The K Factor is displayed as sheetmetal\K Factor in the Model Rules section. When sheet metal parts are unfolded using the Bend Allowance to calculate the developed length, this can be captured and driven using the advanced feature parameters. 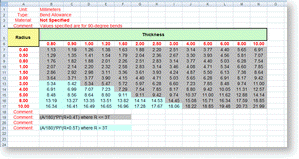 Select Bend Allowance from the advanced feature parameters. The bend allowance is displayed as sheetmetal\Bend Allowance in the Model Rules section. When sheet metal parts are unfolded using the Bend Deduction to calculate the developed length, this can be captured and driven using the advanced feature parameters. Select Bend Deduction from the advanced feature parameters. The bend ded is displayed as sheetmetal\Bend Deduction in the Model Rules section.